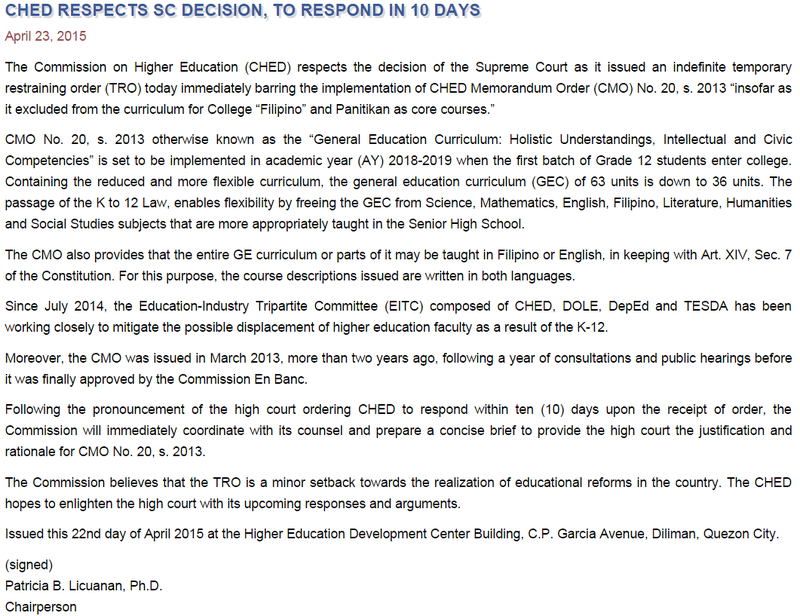 With regard to the temporary restraining order placed on one of its orders, the Commission on Higher Education (CHED) in the Philippines is preparing to respond within ten days. The Supreme Court of course has the final say on how to interpret the highest law of the land. The issue at hand, however, touches on principles that are not specific to the Philippines. These are academic freedom, tenure in higher education, labor protection, as well as rights of learners and instructors. 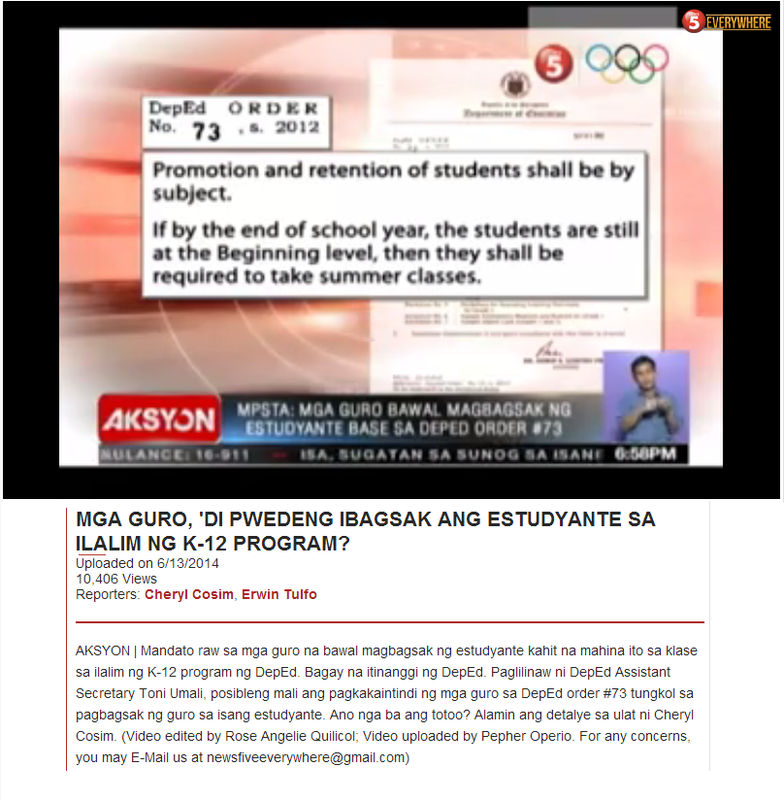 The Philippine Constitution does require something to be present in the curricula of schools; "All educational institutions shall include the study of the Constitution as part of the curricula." One would imagine that what verb follows the word "shall" in the Constitution has been chosen carefully. The combination "shall include" means a requirement. Another section says "Academic freedom shall be enjoyed in all institutions of higher learning." Again, in this instance the provision states something that is specifically required. The phrase "shall be enjoyed in all" provides a clear instruction. Nowhere in the Constitution does it state that subjects other than the study of the Constitution be required in higher education. 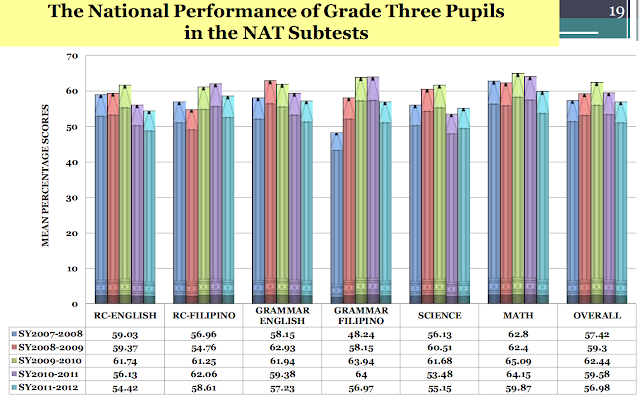 The State is indeed mandated by the Constitution to develop and enrich Filipino. The State is likewise mandated to support science and technology. The State is also required to foster the preservation, enrichment, and dynamic evolution of a Filipino national culture. The State is enjoined to promote physical education. With these provisions, it must be clear that the State cannot do something that goes against what needs to be promoted, developed and encouraged. Obviously, doing nothing to promote, develop or encourage any of these items is also against the law. In my opinion, the wisdom is simple. Requiring a certain course to be taught in higher education is not necessarily promoting or encouraging. In fact, it achieves the opposite. Only scholarly work can promote a given field in higher education. With specific courses being required in colleges and universities, academic freedom is lost. Along with freedom, so does responsibility. With a guaranteed stream of students enrolling in required courses, there is no longer any incentive for both faculty and the State to promote and enhance the field, the discipline, or area of study. Academic freedom must be an absolute in higher education. Otherwise, the word "higher" is likewise lost. "There Are Many Who Are Against K to 12"
Why Parents Must Be Involved?